On this page you will find a FAQ and information about the merger of the NWO institutes with NWO-I. Information about funding instruments, the NWO domains and ZonMw can be found elsewhere (in Dutch). For questions about the merger, please contact the personnel officer of your institute or send an email to: info-nwoi@nwo.nl. Since 1 January 2017, NWO has been split into two legal entities to separate the awarding of grants (NWO) from research performed (NWO-I). NWO-I, in full Stichting Nederlandse Wetenschappelijk Onderzoek Instituten, is an independent foundation within the NWO organisation. NWO-I stems from the part of FOM that supported the institutes (AMOLF, ARCNL, DIFFER and Nikhef) and the university workgroups. The other five NWO institutes, ASTRON, CWI, NIOZ, NSCR and SRON merged with NWO-I on 1 January 2018. The NWO executive board bears final responsibility for the integration of the institutes and NWO-I. The boards of NWO-I and the merging foundations also decide about the merger. A taskforce has been appointed consisting of a member of the NWO executive board (Caroline Visser), the director of the NWO Institutes Organisation (Christa Hooijer), an institute director on behalf of the institutes (Henk Brinkhuis, NIOZ) and Roeland Stolk (Berenschot) who acts as the secretary on behalf of the transition office. This taskforce works in close consultation with the directors of the institutes and directly manages three project teams. The directors of the institutes will inform their employees about the merger. This webpage provides an overview. The office organisation of NWO-I officially started on 1 April 2017 with 46 employees and has three departments: Finances, Personnel & Organisation, and Strategic Support. In addition, there are three clusters: Communications, Legal Affairs, and Real Estate Management. NWO-I continues to host the Dutch Network of Women Professors (LNVH). The NWO-I office is located at The Hague and Utrecht (largest part). Below you will find frequently asked questions (FAQs) about the merger between NWO-I and ASTRON, CWI, NIOZ, NSCR and SRON. 1. How will my status as a staff member change as a consequence of the merger? 2. Do staff with a temporary contract need to be concerned? 3. Will the collective labour agreement remain unchanged? 4. Will everybody retain his/her years of service after the merger? 5. Will my work, responsibilities and position change on 1 January 2018? 6. What does the switch to NWO-I mean for staff with a permanent contract at ASTRON, NSCR and SRON? 7. What does the switch to NWO-I mean for staff with a temporary contract at ASTRON, NSCR and SRON? 8. Who should I approach about personnel issues after the merger? 9. Will anybody be made redundant? 10. What are 'position followers'? 11. What role have the works councils (ORs) played in the process? 12. Where can I obtain advice about the merger and who can I approach with my questions? 1. What will formally change for the institutes? 2. The NWO-I office and the operational management of the institutes work according to a service model. What does that entail? 3. Who in the NWO executive board is the contact person for the institutes? 4. Who will determine the scientific policy of the institutes? 1. Why is NWO in transition? 2. In the new NWO there will be four scientific domains, NOW-I and an operations unit. How will we ensure that these organisational units will work together more closely? 3. How will the collaboration between the domains and institutes be realised? 1. Who is the boss of NWO? 2. Who determines the policy of the new NWO and how large is the role of researchers in this? 3. What does the NWO supervisory board do and what influence does it have? 4. A limited number of disciplines are represented in the NWO executive board. What will be done to ensure that other disciplines are also sufficiently represented? 1. There is a separate foundation for NWO-I. Will the new NWO now be governed as a single organisation or as two separate organisations? 2. And what does that mean for the future of co-determination? 3. Will there be a single set of implementation regulations? 4. Who will be negotiating the implementation regulations (IR)? 1. Where can I find the latest news about the changes at NWO-I? At present the staff of ASTRON, SRON and NSCR are appointed as civil servants and the staff of CWI and NIOZ have an employment contract (employee status). All staff at NWO-I will be employees of the foundation (employee status). This ensures equal opportunities and rights for employees of all institutes and the NWO-I office. As all staff (civil servants and employees) currently already have the same collective labour agreement (the CAO-WVOI), in practice the difference between employees and civil servants is minimal. All the primary conditions of employment are identical. The most important differences concern the type of appointment, the dismissal procedure, and opportunities for temporary appointments. As a civil servant you are unilaterally appointed, whereas an employee has a bilateral employment contract. Consequently, the dismissal procedures differ. For a civil servant, the appointment can be unilaterally terminated and you can lodge an appeal against this. In the case of an employee, the employment contract needs to be dissolved via a district court. The transition does not form a reason for early termination of the temporary contract. Per staff member, it will be assessed at the end of the temporary contract whether the contract will be extended, just like prior to the transition. Yes. The collective labour agreement will not change as a result of the transition but the annual negotiations with the trade unions about the collective labour agreement will continue to take place. The current collective labour agreement is valid until 31 December 2017. Yes. Members of staff who fall under a new employer (NWO or NWO-I) as a result of the transition will retain the years of service they built up under the former employer. The institutes ASTRON, CWI, NIOZ, NSCR and SRON will merge with NWO-I on 1 January 2018. All staff will continue to work at their own institute, also after 1 January 2018. The institutes and the NWO-I office will work together according to a service model (see also question B-2) and this has been recorded in the organisational design. In the spring of 2017, an impact analysis of the service model was performed for the organisations within NWO (the NWO-I office, the institutes, and NWO-D). This revealed that the impact is very limited and will only affect a few positions. The effects for the staff members concerned will be compensated for by natural wastage and limited adjustments to the job positions concerned. The staff members affected are therefore 'position followers' (also see question A-3). Staff members from the so-called job clusters Research, Research Support, Engineering and Library, will retain their position in the current organisational embedding and at the current location. The placing procedure does not apply to them. All other staff members will retain their current position within the current organisational embedding and at the current location. They are therefore 'position followers' (also see question A-3). 6. What does the switch to NOW-I mean for staff with a permanent contract at ASTRON, NSCR and SRON? Staff who currently work at ASTRON, NSCR and SRON are formally in the service of NWO and therefore currently have the status of civil servants. When they become employees of the institutes foundation, they will acquire employee status like the staff at the other institutes. The consequences of this change are minor, because all staff at NWO, NWO-I, CWI and NIOZ have the same collective labour agreement and the same pension scheme (ABP). From a financial perspective, nothing therefore changes for the NWO staff who become employees of the institutes foundation, and they will retain their years of service. However, civil servants and employees do differ with respect to the regulation for lodging an appeal in the case of dismissal. In general, the procedure for appealing against dismissal is quicker and clearer for employees. The number of times that a civil servant can lodge an appeal is virtually unlimited (see question A-7 as well). 7. What does the switch to NOW-I mean for staff with a temporary contract at ASTRON, NSCR and SRON? Just like staff with a permanent contract, nothing will change from a financial perspective for NWO staff with a temporary contract who become employed by the institutes foundation. Independent of the transition however, we will move in the future towards a smaller number of (more) generic job descriptions. There are also differences in the maximum duration of appointment for temporary staff such as postdocs and PhDs at ASTRON, NSCR and SRON. - tenure Track: a maximum of six years (can be extended once for three months). For civil servants who are currently in the service of NWO the principal rule for temporary contracts is: a maximum of three successive contracts in a maximum of three years. Contract for 'specific work': a maximum of three successive contracts in a maximum of six years. Tenure Track: a maximum of six years. Should staff with a temporary contract experience any negative consequences as a result of the switch then a solution will be found per individual case. After the merger, employees will be able to contact the Personnel & Organisation department of their own institute for questions about salary slips, reporting sick and paid leave. For the time being, the existing procedures for reporting sick and taking leave will remain unchanged. NWO-I has an employees' portal 'NWO-I People' (see https://nwoi-people.nwo.nl/) where all employees with a personal username and password combination can inspect and download their payslips and annual statements. Institute staff will receive information about this only after 1 January 2018. The NWO transition is not a cost-saving operation. There will be no compulsory redundancies. The aim is to make the organisation structure more flexible and effective and to facilitate the collaboration between the different organisation units. 'Position followers' are employees whose position remains virtually unchanged in the new organisation. All staff of the institutes are 'position followers'. Since the start of the (preparatory) activities in the context of the merger of the institutes, intensive discussions have taken place with the works councils. The transition was a recurring subject on the agenda during the structural consultation meetings. In May 2017, two requests for advice were sent to COR NWO, OR NWO, OR ASTRON, OR SRON, OR NIOZ, OR CWI, OR AMOLF, OR DIFFER, OR NIKHEF and OR ARCNL. b. Request for advice II: 'Request for advice concerning important changes in the organisation, the allocation of competencies, and the consequences for staff'. The co-determination bodies of NWO generally issued positive advice about both requests for advice. Several works councils refrained from issuing an advice. These councils indicated that they saw no impact for their own institute or that they had decided to issue an advice via the central works council. Several works councils issued a conditional positive advice. You can always direct questions to your line manager and to Personnel & Organisation. Furthermore, consultation sessions will be organised at all of the institutes in the period October to December 2017 by Personnel & Organisation. Of course, you can also always speak to your line manager if you are concerned about the transition process in general. On 1 January 2017, FOM was transformed into the institutes foundation NWO-I. With effect from 1 January 2017, the former FOM institutes AMOLF, ARCNL, DIFFER and NIKHEF therefore automatically became part of NWO-I and the staff at these institutes have since been employed by NWO-I. The current PhDs at universities who were in the service of FOM will complete their contract under the employment of the institutes foundation. The other institutes ASTRON, CWI, NIOZ, NSCR and SRON will merge with NWO-I on 1 January 2018. The service model describes the relationship between the NWO-I office and institutes, the NWO executive board and the NWO-I board, as equally with NWO. It concerns support in the area of strategy, financial management, purchasing, real estate, personnel, support services, ICT, communication and legal affairs. The NWO-I office also maintains functional contacts with the operations departments at NWO. On 1 April 2017, the strategic support department at the NWO-I office started. From 1 January 2018 onwards, once all institutes have been merged with NWO-I, the NWO-I office will work in accordance with a service model for all of the positions described above. 3. Who at the NWO executive board is the contact person for the institutes? Firstly, a clarification about the allocation of roles between the NWO-I foundation board and the NWO executive board: the institutes will soon be governed by a single board, the NWO-I foundation board. The NWO-I foundation board forms a personal union with the NWO executive board, in other words both boards will consist of the same people. It was a deliberate choice to make the NWO executive board jointly responsible for the institutes. It means that the NWO executive board will be responsible for policy-related issues with respect to the institutes and the NWO-I foundation board will be responsible for the operational management within NWO-I (including the institutes). Each NWO executive board member has a broad portfolio with focus areas. The entire list of focus areas can be found here, or can be requested via the executive board office. For each institute there is also a portfolio holder within the NWO executive board. This allocation can be found in the table below. These portfolios should also make informal contact easier between the institute director and NWO executive board member. Independent of this, there will be a consultative body consisting of the NWO executive board, the joint institute directors and the director of NWO-I. NWO executive board members may be asked to attend meetings of the institutes directors, and the institutes directors may be asked to attend NWO executive board meetings. Scientific activities fall outside of the scope of the merger and the missions of the institutes will not change as a consequence of the merger. Each institute director will be given a broad mandate within the mission of his or her institute to prepare the implementation strategy with the appropriate entrepreneurship and within the prevailing frameworks for the entire NWO-I. The NWO executive board will approve or adjust the mission of each institute. That could, for example, happen in the context of the strategy cycle of NWO or as a result of the new portfolio analysis of the NWO and KNAW institutes. Within scientific research there is a growing demand for broad multidisciplinary research projects, collaboration and innovation. The new NWO is more effective and more focused on collaboration, more flexible in deploying resources and better able to respond to developments within science. 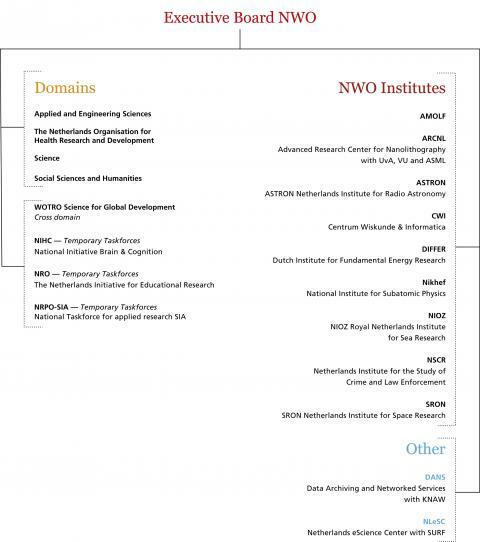 In the Dutch Government's Vision on Science (2014) and NWO's new strategy (2015) it was announced that the NWO organisation would be modernised. Under the chairmanship of Douwe Breimer, a workgroup designed a new organisation model that received widespread support. This model, approved by state secretary Dekker in April 2015, makes it easier to work across the boundaries of disciplines and organisational units but retains the connection with the scientific field and science disciplines. This model also more strongly links the governance at the top of the organisation with the domains and institutes, and facilitates collaboration of the institutes with each other and with the domains. 2. In the new NWO there will be four scientific domains, NWO-I and an operations unit. How will we ensure that these organisational units will work together more closely? The directors of the institutes, including the director of the NWO-I office, together form a collegial directors' consultation and ensure a good exchange of information, programming and joint realisation of the NWO-wide subjects and programme. Likewise, the directors of the four domains (including ZonMw), director of operations head of the executive board office, and director NWO-I office form a collegial directors' team. The director NWO-I office therefore attends both directors' consultations and accordingly acts as a linking pin. - in the field of collaboration in overarching teams and with the help of the institute liaison officers. The institute advisory council is made up of representatives of the domain boards relevant for the institute as well as representatives from other stakeholders within science, society and industry. The institute advisory council plays an important role in maintaining close contacts between the institute and relevant stakeholders. The NWO executive board functions as a collegial board and bears the responsibility for the entire organisation and therefore all of the work that takes place in the domains and institutes. The NWO executive board mainly governs at the level of the overall strategy and has mandated many granting decisions to the domain boards and domain directors. The institute directors will continue to bear primary responsibility for work performed at the institutes and making specific strategic choices. As a collegial board, the NWO executive board is responsible for the institutes (see also question D-4). The NWO executive board and the domain boards govern at the level of the overall strategy and make directional choices. In close consultation with science, government and society (including industry), the domains, institutes, the NWO supervisory board and the NWO advisory council as well as the advisory bodies of the domains provide input for this purpose to the NWO executive board and the domain boards. At least four of the six members of the NWO executive board are renowned scientists, who are also the chair of one of the four domains (also see question D-4). Many of the members in the other bodies mentioned are researchers. NWO is primarily governed by and serves the scientific field, focussed on science and the application of research in society and of knowledge in health care. The NWO supervisory board supports the NWO executive board with solicited and unsolicited advice about the executive board's policy. In fulfilling its task, the NWO supervisory board considers the interest of the organisation and in doing so takes the objective of the organisation as its starting point. On the basis of the NWO-I statutes, the NWO supervisory board has, in any case, advisory tasks with respect to the decisions of the NWO-I foundation board concerning the establishment (transfer, termination, etc.) of an institute, entering into a partnership with a major financial commitment, changes to the statutes, merger (or splitting) and the use of any positive balance following a liquidation. The NWO executive board is a collegial board. That means that they are jointly responsible for governing the entire NWO organisation and must ensure that full advantage is taken of science across the entire spectrum of types, disciplines and objectives. On the basis of this role, 'representation of' within the NWO executive board is therefore not relevant. NWO executive board members do not have the task of looking after the interests of units or groups at the board meetings. That is why in the Breimer plan the choice was made not to appoint an 'institutes representative' in the NWO executive board. The four scientific members of the NWO executive board each have a domain in their portfolio. As part of this responsibility, they also have the role of the domain chair. The board members who together with the domain chair form the domain board are jointly responsible for properly covering and obtaining insight into all disciplines, types of research, and groups that belong to that domain. The NWO executive board also bears an integral responsibility towards the institutes. 1.There is a separate foundation for NWO-I. Will the new NWO now be governed as a single organisation or as two separate organisations? The NWO organisation will be governed as a single integral NWO organisation, with a single board, the NWO executive board that forms a personal union with the NWO-I foundation board. This means that the same people are members of the NWO executive board and the NWO-I foundation board (also see question B-3). 2. And what does that mean for future co-determination? With effect from January 2017, there has been a central works council (COR NWO) in which all organisation units of the new NWO are represented. The local works councils of all institutes (AMOLF, ARCNL, ASTRON, DIFFER, Nikhef, NSCR and SRON) have a seat in this. CWI and NIOZ have a guest seat and after the merger on 1 January 2018 they will also have a permanent seat. For the time being, the ZonMw works council also has a guest seat. The NWO works council has five seats in the COR, of which one seat is for the NWO-I office. Yes, the aim is to realise a single package of implementation regulations (IR) for the entire organisation. The implementation regulations state which regulations apply to facilities offered by the employer to enable employees to realise work in a good manner (for example commuting costs, international work trips, confidential advisers, etc.). This process commenced in 2017, and negotiations are currently underway with the works councils to arrive at a new IR. 4. Who will be negotiating the implementation regulations? For the negotiations about the implementation regulations, a covenant has been agreed between the four employers (CWI, NIOZ, NWO and NWO-I) on the one hand and the COR NWO, OR CWI and OR NIOZ on the other. In this covenant, agreements have been recorded about the organisation of authority, competencies and control in the process of harmonising the implementation regulations of NWO, NWO-I, CWI and NIOZ into a single set of NWO-wide implementation regulations, valid from 1 January 2018 onwards. The COR NWO has the right of approval on behalf of the NWO and CWI works councils. The OR-CWI has mandated its representative in the COR-NWO for this purpose. The representative of OR-NIOZ in the COR-NWO will convey the opinion of the OR-NIOZ concerning the implementation regulations; the OR-NIOZ has not mandated its representative to give approval in the COR-NWO. The NWO executive board is negotiating on behalf of the employers CWI, NIOZ, NWO and NWO-I. To this end, the employers have mandated Caroline Visser, vice president of the NWO executive board and portfolio holder operations and finances, to negotiate on their behalf. On this currect page you are visiting: www.nwo-i.nl/merger (Dutch: www.nwo-i.nl/fusie). If you have any questions, please contact us via info-nwoi@nwo.nl.